Janet Sinn-Hanlon, Alan Craig and Kerry Helms pose with “Dr. Moolittle.” The veterinary medicine design team created an app that allows users to see a cow’s internal organs and systems in 3-D when a device is pointed at Dr. Moolittle. CHAMPAIGN, Ill. — Point your phone or tablet at the poster with a cow image and a small 3-D cow appears before you – Desktop Bessie, with her skeleton, circulatory, digestive and nervous systems, and various organs visible as you move around her. If you’re a veterinary student, the augmented reality cow is a great way to learn a cow’s anatomy. If you’re not a vet student, it’s just cool. A design team at the College of Veterinary Medicine created “Desktop Bessie,” an augmented reality cow that shows a cow’s internal anatomy in 3-D from various angles. It can be used to help veterinary medicine students learn anatomy. Video by L. Brian Stauffer. GIF created by Anne Lukeman. 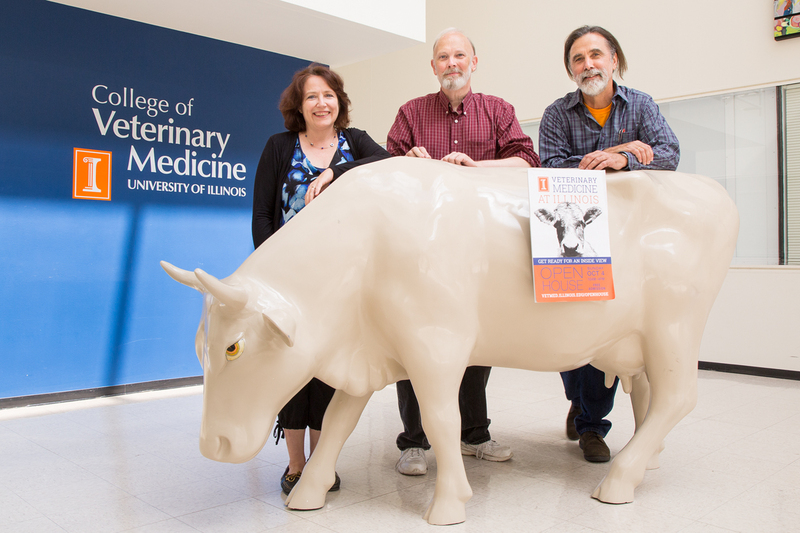 Desktop Bessie made her debut at the University of Illinois College of Veterinary Medicine Open House on Oct. 4. Bessie and the app that makes her possible were created by a team of designers at the College of Veterinary Medicine. Kerry Helms, the creative director and senior designer for the Design Group at Vet Med, said the college uses a wide variety of models, mannequins and simulations to augment learning and ensure students are as prepared as possible to work with live animals. “We see this as an additional tool for teaching and learning anatomy,” he said. Medical illustrator Janet Sinn-Hanlon modified commercially available models of a cow’s organs to make them anatomically correct. The 3-D model shows the skeleton, heart, lungs, four-chamber stomach, spiral colon, liver, gall bladder, kidneys, uterus and ovaries, as well as the major blood vessels. Alan Craig, an augmented reality developer working with the veterinary college on this project, created the apps. Craig used computer vision software, and when the device with the app “sees” something it recognizes – the cow poster created by Helms – it displays the 3-D model of the cow that Sinn-Hanlon built. The system also must recognize where the camera in the device is in relationship to the cow image to display it appropriately as the user moves around and looks at the organs from different angles. Getting the image aligned with the position of the user in the real world was the tricky part, Craig said. “The critical element with this is it engages your body. Instead of just swiping or using a mouse, you’re looking around it,” he said. Craig also built into the app a way to look at the different anatomical systems separately. Touch the head of the cow on the poster and you can turn the view of the skeleton on or off, for example. Craig built other “buttons” into the poster cow’s hindquarters, udder, front legs and back legs that can turn on or off the images of other systems. Craig and Sinn-Hanlon also can control the transparency of the image the user sees. For example, they can make the ribs more transparent to better see the heart and lungs. The skin was made totally transparent for the demonstration at the open house. “I can imagine two students sitting at a table, studying the cow’s anatomy with the 3-D cow appearing to stand between them on the table,” Helms said. Eventually, Craig said, he’d like to animate the cow app. “It doesn’t just have to stand still. We can give it behaviors and have it move around,” he said. 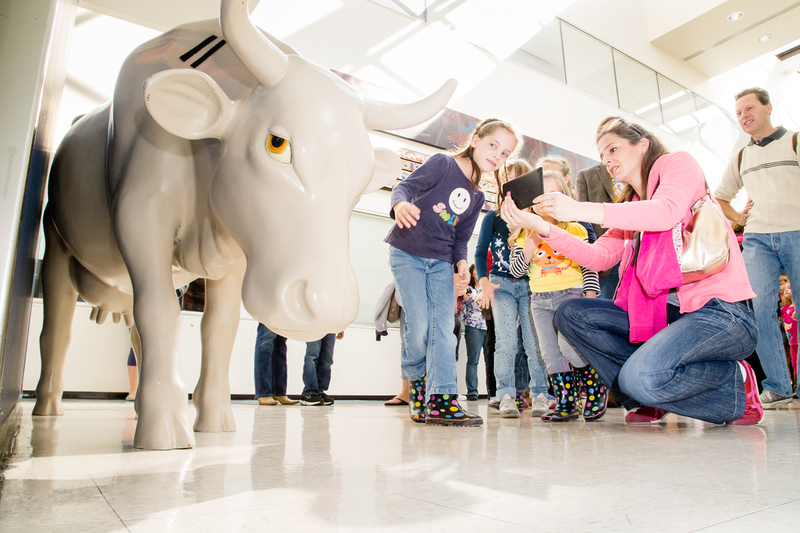 A second app works with a fiberglass cow sculpture – Dr. Moolittle – that was originally decorated as artwork for the Cows on Parade exhibit in Chicago in 1999. The app shows the organs, skeleton and blood vessels in the appropriate size and position as the user points a device at the sculpture. The push toward using interactive 3-D tools to teach veterinary science at the veterinary college was initiated by Gerald Pijanowski, a retired veterinarian and anatomy instructor. Pijanowski and Sinn-Hanlon teamed up in 2010 to develop a 3-D model of a dog’s leg based on CT scan and MRI data. The 3-D model could be rotated and magnified, and anatomy students could turn the individual structures on and off. The current apps grew out of some other projects involving the design team. Helms designed a T-shirt with the image of a heart, Sinn-Hanlon illustrated the heart and created a beating animation, and Craig developed a way to use a device to see the heart beating in orange and blue, with the university’s insignia, a block “I,” on the wearer’s chest. The team would like to develop 3-D images of other animals. Sherry Lanzo, who teaches in the clinical skills laboratory at the veterinary college, said the app will help students visualize how organs and the blood supply and other internal structures relate to one another underneath the cow’s skin and skeleton. For example, if students could see the lungs expanding as Desktop Bessie “breathes,” they’ll be able to see how much the lungs inflate and how they move across the abdominal structures. “I think having this will be a big aha moment,” Lanzo said. Editor’s notes: To reach Kerry Helms or Janet Sinn-Hanlon, email DesignGroup@vetmed.illinois.edu. To reach Alan Craig, email a-craig@illinois.edu.